Napa Valley has come a long way from the mid-1800s, when the primary crop that grew here was wheat. Today Napa Valley is inarguably California’s premier wine region. This roughly forty-mile-long valley, northeast of San Francisco, has been graced with what is effectively a perfect climate and soil for growing the king of red grapes, Cabernet Sauvignon. Top Napa bottlings are the benchmark for this varietal in the US (they cost a pretty penny, too). But Napa isn’t just Cabernet—other Bordeaux red varieties like Merlot and Cabernet Franc grow particularly well here, too, as does Sauvignon Blanc. Sonoma County’s roughly 60,000 acres of vines, adjacent to those of Napa Valley but separated from them by the Mayacamas mountains, are divided into a number of significant AVAs (American Viticultural Areas). 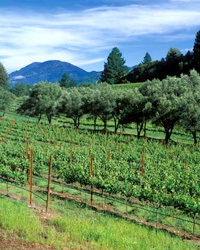 Some, like Russian River Valley and the Sonoma Coast, benefit from a cool marine influence that brings early morning fogs and cold nighttime temperatures, making them ideal Pinot Noir and Chardonnay growing areas; others, like Dry Creek Valley and Alexander Valley, are warmer, and produce superb Cabernets, Syrahs and Zinfandels. F&W’s guide to Napa wineries. Senior wine editor Lettie Teague catches up with Napa’s most famous vintner. Top Napa and Sonoma hot spots. Ever fantasize about owning a piece of Napa Valley? There’s more to it than just writing a (very big) check for a winery. A comprehensive guide to Napa. Hotels, wineries and more in Sonoma. A user-driven Napa visitor’s guide.